Sorry about two cauliflower recipes in a row, I was convinced I used the nine of them I had in my case, then I found this one, that needed to be consumed or would go bad. Since I never throw away food (or at least I try), my father would always tell me when I was growing up, “You cannot throw away food, there are too many people starving in the world”, so now I do feel guilty to throw away anything. When you think about it, in our Western world, people die because they eat too much, in some other parts of the world, people die because they have nothing to eat. How unfair and absurd is that? I think cauliflower is an amazing vegetable, and its use is so versatile…I was trying to find a way to combine it with seafood, and this cappuccino perfectly achieved what I had in mind, associating two complementing and opposite textures, the creaminess of the cauliflower with chewiness of the clams. That was a lovely combination, especially with the delicate touch of saffron (which I adore with seafood). Now you might wonder why this is called cappuccino, since there is no coffee in it, and certainly cannot have this for breakfast. The cauliflower being cooked in milk and the foam used to top off the soup, the whole thing served in a cappuccino cup, it definitely resembles a savory version of the traditional and very famous coffee drink. It’s a nice festive and delicious soup, so when you have no inspiration for cauliflower, try this soup, it’s such a treat. In a large pot, heat olive oil add leek, potatoes and cauliflower and cook vegetables stirring for about 10 minutes. Add broth, milk and saffron, salt and pepper. Cover with a lid and cook at medium heat until the vegetables are tender. Remove from heat and keep about 1/2 cup of the milk aside. Let it cool. In another pot, heat olive oil and clams. Adjust with salt and pepper, and let the clams open. When the clams are open, remove from heat and keep warm. Using a hand blender blend vegetables into a thin puree. Pass through a sieve to obtain a creamy and smooth texture. If the consistency is too thick, add a little broth. To make foam, place cooled milk (set aside) in a small pot and heat it up without boiling it. Whisk gradually milk to make it foam. When obtained desired and thick foam. Pour soup on cappuccino cups, add 2 tbs foam on each cup and place 4 clams on top. Decorate with saffron threads and chives. Serve hot. This entry was posted by silvia on September 12, 2010 at 5:13 am, and is filed under Soups. Follow any responses to this post through RSS 2.0.You can leave a response or trackback from your own site. what a great recipe, I can’t wait to try this!!! Oh Silvia, 2 posts in a roll! No kidding! haha… And this looks as wonderful and comforting. Thank you for the recipe. Enjoy your day. What a delightful soup! When are you going to visit Florida and teach me this gorgeous presentation? Your amazing! love the colors and flavors so pretty! You are absolutely right Sylvie. In our country people die of obesity, heart attacks and diabetes while people in some countries lack proper nitrition or anything to eat at all. I never thought of it that way. If only we could share this delicious dish with the world. This soup is so simple, yet looks so delicious, Silvia. 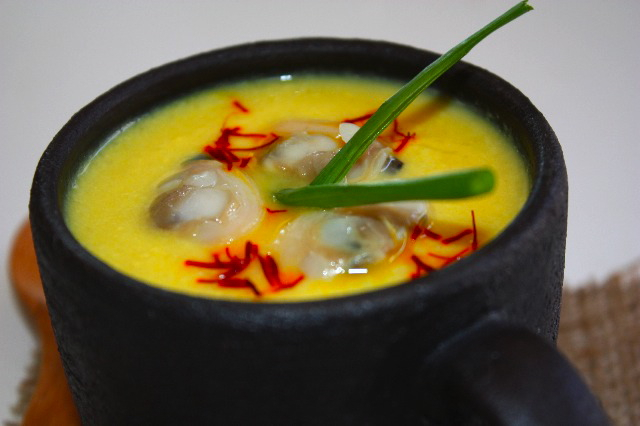 I love the fresh looking clams floating atop the velvety & rich color of the soup. But what is a ‘dose of saffron’?? 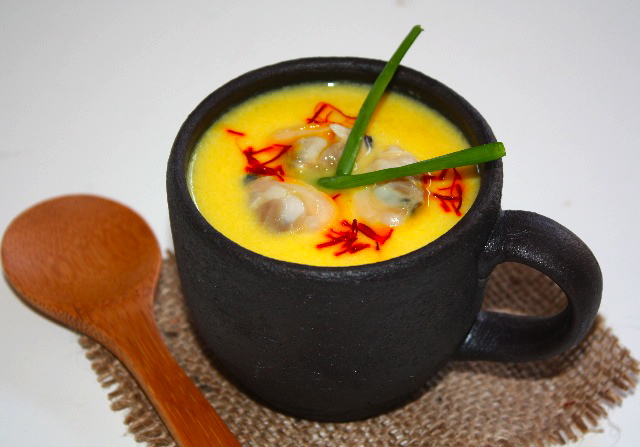 Superbe cette soupe dans une tasse en grès; j’adore le saffron comme toi, avec les fruits de mer surtout; et le chou-fleur est assez neutre pour s’accommoder de tous ces parfums forts. Il fait froid chez vous sans doute? Ici, c’est encore la canicule! This looks and sounds fabulous. The combination of cauliflower and seafood makes perfect sense to me. One of my favorite ways to enjoy the vegetable is with an anchovy sauce (with or without pasta). I bet clams are wonderful, too–brinier, fresher and ‘brighter’ than anchovies. And, needless to say, the colors are just gorgeous! I am all about the cauliflower…so keep the recipes coming! I love the vegetable, and I just bought a huge jacket cauliflower at the market today. I love how you served this in such a beautiful earthen mug. It looks and sounds delicious! The colors are stunning – isn’t saffron the most amazing thing? I love the dish. So colorful and light!~ does this mean the sun is shining once again in SF? Silvia, no need to apologize for THIS! What a deep and silky soup. I think the addition of clams was the perfect touch to send this over the top! What a fantastic clam dish. A pinch of saffron goes a long way. I agree that it pairs perfectly with seafood. Another appealing dish for the eyes as well as the palate. I can appreciate the tender loving care you took with the presentation and texture of the soup. No need to apologize! This looks awesome! Aren’t you having fun with cauliflower, Silvia? The color is lovely and I love the idea of combining seafood with cauliflower. It really looks delicious. Such an appealing presentation too!! Don’t apologize – you’ve given us two inspiring ways to prepare cauliflower! Love the beignets and the history behind them. I won’t throw away food either – my parents said the same thing – we hated hearing it, but its true. how interesting to call this a type of cappuccino! it looks delicious – and you can never have too many cauliflower recipes! Love that you’re giving us all these great recipes with cauliflower because it’s never truly been my go to vegetable…however, I have found myslef using it more often in the past few years. You never fail to wow me with your wonderful foods! I love how you take culinary concepts and turn them on their ear! This is pure delight! Love the combination of seafood and saffron! The presentation is so novel!! The saffron gives a wonderful color, and I’m sure taste too, to tha cauliflower. I have to admit to not being a lover of cauliflower, but your photos with this beautiful color has me considering that it could be good!